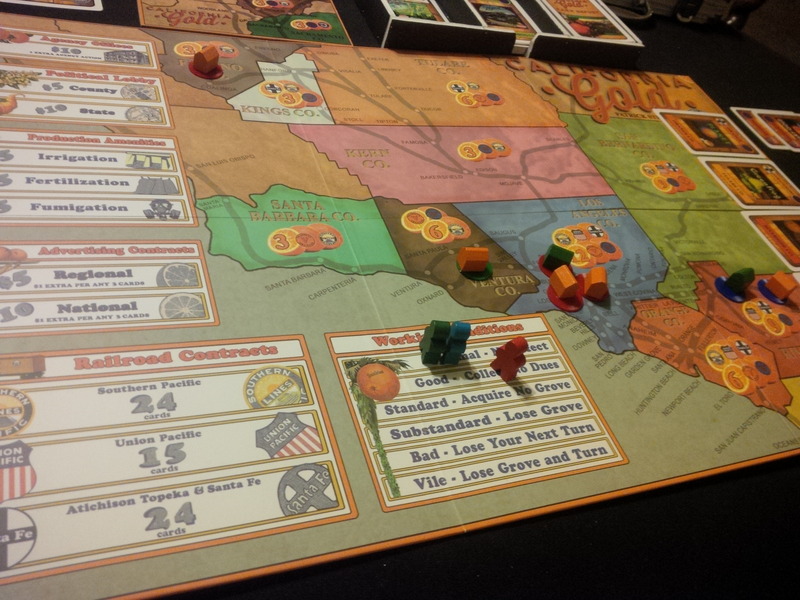 California Gold is a pretty intense economic game, focusing on farming oranges in California. Each player is running their own co-op and trying to add orange groves to it; groves pop up in the different counties of California, and you can only collect them by building packing houses there and spending an action to take the card. The more orange groves you have, the more money you’ll collect; Valencia oranges are worth one dollar per card, while Washington Navel oranges are worth two dollars per card, but are more vulnerable to weather that can keep you from collecting from them. The grove cards also come in sets that help you gain influence with different railroads, bringing in even more money. You’ll get money for each train token you’ve placed (which requires three grove cards with that railroad’s symbol), and more money if you have more trains with that railroad than anyone else. You’ll need more packing houses to get these cards, though; you start with one in one county, and to get a card, you need to have a packing house with capacity (each can hold three cards) in the county the card is from. Each packing house you build both costs money itself and makes it more expensive to keep your workers happy (something you have to pay for every round, or risk being affected by strikes), so you have to carefully consider your timing in expansion, and also which rivals you’ll be competing with in a particular county. Money and actions are tight in this game, especially early on. You have to build a significant engine to make your collect dues actions efficient, but to get there, you’re going to have to carefully grab cards early on and also monitor what your opponents are doing. Later in the game, money becomes less of a problem, but there are more things you have to invest in, such as advertising to boost your revenues, additional buildings such as nurseries and agencies to give you free actions, and political lobbying and infrastructure improvements to protect yourself from attacks. California Gold, early in the game. Attacks? Yes, there are attacks. What separates this from a lot of economic simulators like, say, Power Grid, is that there’s a ton of direct interaction as well. Competing for cards is one thing, and one of the possible actions you can do is to wipe and refresh the deck of available cards (which can be very mean if the next person’s targeting some; however, you only get two actions per turn, so you can’t do this regularly), but what’s even stronger are the event cards. Each player has a hand of six of these, and the start player in each round gets to play one (and then draw back up to six). Most of them are nasty effects that go off under certain conditions; for example, a drought prevents those who haven’t taken the irrigation action from collecting dues this round. This is done in a cool way; the one-per-round mechanic keeps them from getting overpowered, the necessity of playing one (and not requiring an action to do so) means that players both can’t opt out of it and can’t go for an attack-focused strategy, and the choose-one-from-six gives players far more agency than a random event deck would have. Also, it’s nice that while most of these effects are damaging, the majority are about preventing players from doing something for a round than taking something away from them. Thus, they’re more delaying than destructive, providing interactivity without stealing a player’s hard-won cards (important, considering that the win condition is collecting a certain number of groves). I had a lot of fun with California Gold, and not just because I wound up winning with 21 groves. There are plenty of interesting decisions in this one, and it’s a great underutilized theme with what looks like an impressive attention to historic detail (while still keeping it game-focused). Our play with three players (and the Northern Counties expansion) did take a little over the listed 120 minutes, and the others said it felt a bit draggy at the end and is better with more people (which doesn’t necessarily make it take longer, as the numbers of groves to collect for victory decrease), but I enjoyed it fine with three. If you like economic games, and also like more interaction than they often provide, this may be one to check out. We played this fun little filler Tuesday after wrapping up California Gold. A fourth player had joined by this point, so we had a few quick rounds of this. 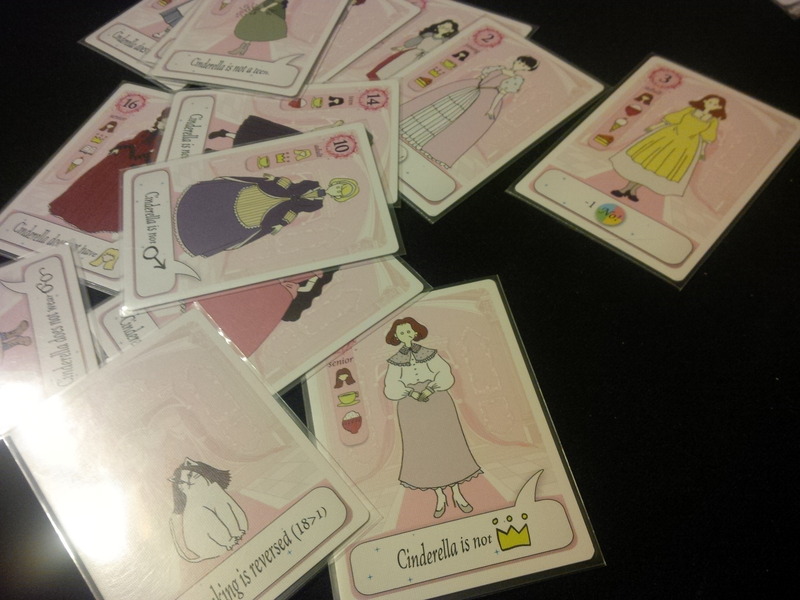 In summary, Too Many Cinderellas features 18 possible Cinderellas, each with traits and rules. The traits, along with the Cinderella’s number, help determine if they are the real Cinderella if left in your hand; the rules come into effect if you play them to the table instead, and help restrict who the real Cinderella is. Perhaps she isn’t young, or doesn’t like ice cream, or doesn’t have glasses. Players get four cards and take turns playing one until everyone has two left in hand. After playing a card, there’s a vote to see if its rule will take effect; everyone else has the opportunity to reveal a “No,” which nullifies the rule, but which each player can only do once per game. This leaves everyone with two candidate cards, plus one revealed off the deck. The real Cinderella is the one numbered closest to 1 (unless the cat has been played, which reverses the numbers). A good quick game; there’s only some strategy, and a lot of chaos, but it has fun moments. Codenames is a blast, and is quickly becoming one of my favourite party games. There are two- and three-player variants that I haven’t played yet, but the base game with 4+ is fantastic. 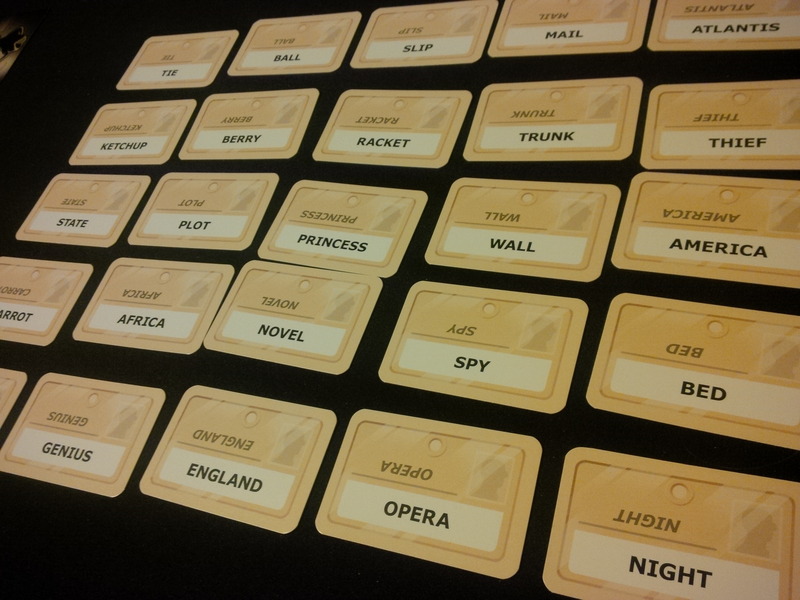 You divide into red and blue teams, each with a spymaster, deal 25 clue cards out of a deck, have the spymasters look at a location card that shows which word card corresponds to which agent, and then have them proceed by giving their team one-word clues with a number of words the clue links to. (For example, “Imperial 2” might mean “tie” and “fighter”.) The team must then discuss among themselves (if there’s more than one team member guessing; with four players, each team has just one spymaster and one guesser) and point to the card they think is indicated. If they’re correct, an agent of their colour’s revealed, and they can take another guess. If they’re incorrect, it can be a bystander (neutral, but ends the turn), an enemy agent (helps the other team advance towards winning, ends the turn) or the one lone assassin (instantly ends the game in a loss for the team that picked it). The winning team is the team that reveals all of their agents first, nine if they received the first turn or eight if they didn’t. Codenames is very simple and easy to learn, but has tons of replayability, and forces your brain to think hard and make clever connections. It may be somewhat better with groups that know each other at least somewhat and know what references they can make, but there are enough connections between these words you can get there without too much trouble most of the time. I’ve played this three or four times so far and had a blast each time. This is currently the top-ranked party game on BoardGameGeek, and it might be the best one I’ve played too.